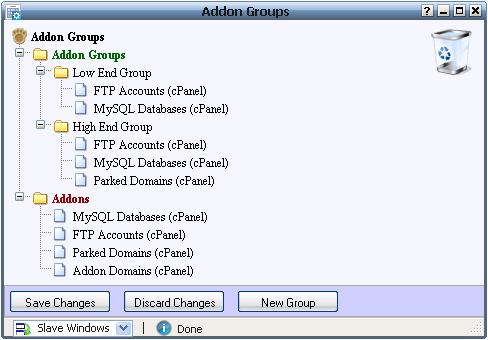 The screenshot shows two addon groups configured - Low End Group and High End Group. 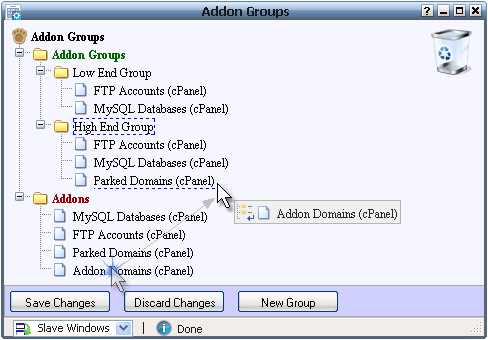 In this example, the FTP Accounts and MySQL Databases addons are shown for packages that use the Low End Group as well as the High End Group. The Parked Domains addon is shown only for packages that use the High End Group. Further, the addons will appear in the order form in the same order they are displayed in the screenshot. The New Group button is used to create a new addon group. An addon group can be dragged to the trash can on the top right to delete it.